The continuing success of digitization across the Middle East and rapidly among the GCC (Gulf Cooperation Council), brings with it complementary and growing exposure to the risk of cyber attacks. These rising cyber threats by other countries and by highly expertise criminal rings from around the world have the potential to disrupt the progress of digitization and threaten the reimbursement delivered through it. Around 57% of Middle Eastern companies lost approximately USD 500,000 compared to 33% globally due to cyber attacks. For instance, Oman banks suffered loss of USD 45 million as result of ATM cyber-heist in the region and in 2012 Qatari natural gas company (RasGas) got smack with similar shamoon virus that shut down its website and e-mail servers. The GCC cyber security spending with the exception of the banking and energy sector does not meet the global standard. Only about 37% of the major firms have comprehensive security and training services as compared to 53% globally. In present scenario, the views in the region towards cyber security are beginning to turn, with the recruitment of professionals on the rise and many big cyber security firms are setting up in the region to protect the businesses and general public from cyber threats. For instance, Rytheon the U.S. based Technology and Innovation Company, is at forefront in developing global cyber security and defense solutions, is the one of the major firm providing cyber security to GCC institution and businesses. GCC cyber security market accounted for USD 7.2 billion in 2016 and is anticipated to reach USD 11.4 billion by 2024. 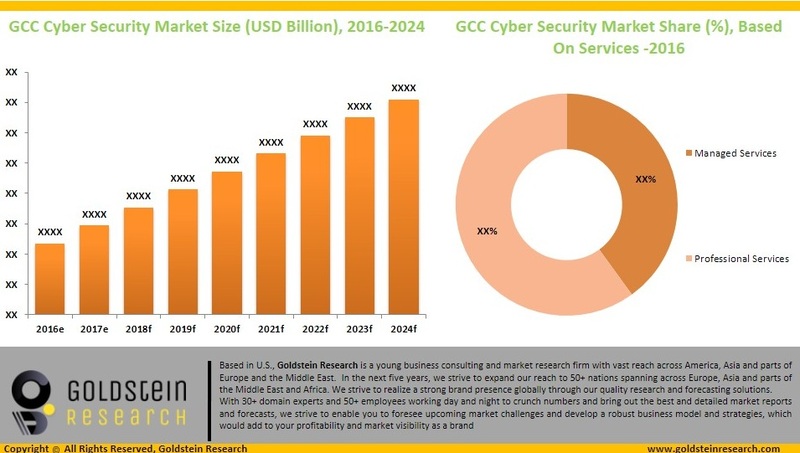 Further, the GCC cyber security market is projected to register a CAGR of 5.9% during the forecast period i.e. 2016-2024 as GCC businesses are preparing themselves for more advanced cyber threat levels especially in the era of technology development and implementation. Most of the cyber security professionals in GCC are mainly located in Saudi Arabia and UAE in the two largest countries for government organizations, financial services and private/industrial businesses. On the other hand, Qatar, Kuwait and Oman accounts for much smaller number of cyber security professions, generally a fraction of total number of ICT workers in respective countries. Geographically, UAE accounted for the largest market for advanced cyber security solutions with more than 35% market share in GCC cyber security market owing to expanding BFSI sector over the past few years. Saudi Arabia closely follows UAE accounting for 30% market share in the GCC cyber security market and growing at a healthy rate on the back of mounting Oil & Gas Sector. 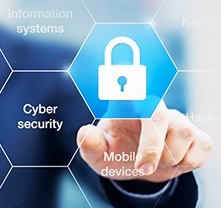 Middle East countries particularly GCC countries are pursuing digitization and the mass adoption of connected technologies by the governments, enterprises and consumers at rapid pace has significantly raised the concerns for cyber security threats. The region's digital market is expanding at a CAGR of 12% and is expected to be worth more than USD 85.0 billion in 2024. Rapidly rising digitization along with spurring incidences of cyber crimes has significantly shifted the regional governments focus towards this national security threat and resulted in various initiatives by the government to curb this threat. For instance, in 2016 Qatar's Ministry of Interior establishes a new state-of-the-art security monitoring and counter cyber crime headquarters to inspect the escalating number of cyber offenses in the country. Not only BFSI, Cooperate firms and government institutes are threatened by the cyber attacks but also the general public suffers from these attacks which intense the current situation as the privacy of general public is on verge. In 2016, publically engineered phishing mails along with other e-mail cyber attacks were major concern. These threats are expected to grow as the reliability on internet and usage of smartphones are increasing in today's world. Moreover, phishing attacks are the most common security challenge faced by the organizations that enable access to bank details, passwords and other sensitive information including phone calls, emails and social media accounts. Rising adoption of smartphones and growing penetration of internet among general public and in industries such as retail, healthcare and energy is likely to supplement the growth of GCC cyber security market.